Blue crab, crab legs, crab cakes, she crab soup—crab doesn’t get any fresher or tastier than in South Carolina! The Palmetto State’s prime coastal location makes it easy for restaurants and local markets to dish out only the best crab offerings. Sure, crab legs mean a little extra work for you, but the results at these 10 best places for crab in South Carolina are nothing short of incredible. Serving up some of the best crab legs in Charleston is no easy feat, as you can find crab just about anywhere you go. But fans love the variety of crab dishes at Hyman’s! Take your pick of red crab claws, crab cakes, crab and shrimp dip, she-crab soup, and crab cake tacos. You can’t go wrong here. Murrells Inlet has become somewhat synonymous with the phrase “best seafood ever,” and Hot Fish Club proves it. Their menu is chock full of deliciousness particularly in their crab offerings: crab cakes, Alaskan snow crab clusters, crab steam pots, Dungeness crab clusters, she-crab soup, and blue crab fondue are sure to please every crab lover in your group. If you’re looking to go beyond traditional crab legs and crab cakes, head to 167 Raw and order chilled Jonah crab claws, which you can get by the claw or by the dozen. Aside from the freshest tasting crab you’ll find in the Holy City, you’ll also find a good variety of raw bar eats, tacos, and sandwiches. And make sure you save room for the key lime pie! If you’re craving crab legs, you’ll be happy to know that they’re included in the buffet price at Captain George’s. Eat your fill of Alaskan and Dungeness snow crab legs, along with soft shell and hard blue crabs when in season. They also offer all-you-can-eat she-crab soup and deviled crab. It isn’t always easy to find good seafood this far inland, but somehow Crab King has managed to do so with ease, bringing some of the best seafood to the Upstate. 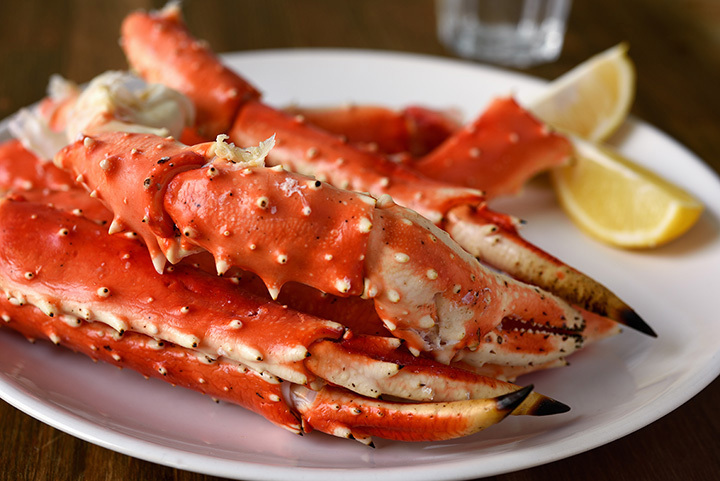 Here you can indulge in a variety of crab dishes, including garlic snow crab, Dungeness crab, blue crab, king crab legs, and seafood combinations. It might have “oyster” in its name, but Bimini’s is a crab lover’s food paradise! Here you can feast on crab legs, crab cakes, crab salads, and deviled crab. If you can’t decide between crab and their other seafood options, try one of their steam pots that offer crab legs, shrimp, mussels, clams, and all the fixings in one tasty creation. Join the party on the deck or head inside for some of the tastiest crab in the Grand Strand. This waterfront dining locale offers Alaskan king crab legs, blue crab bites, miniature crab cakes, and snow crab legs to keep your appetite at bay. They also offer a fresh seafood market to help you sate your crab cravings when you make it in for a meal. Crab legs, crab legs, crab legs. Their menu says it all. You won’t find any better crab legs on the island. They also feature a generous menu offering of both land and sea, which means you can please everyone in your party, including yourself. The main specialty here is, of course, oysters, but the crab legs are not to be outshined! Here you can get Alaskan snow crab legs every night of the week, much to the delight of their local fans. If you just can’t get enough crab legs, DeShawn’s will serve you all you can eat. Locals and travelers alike flock to this eatery to fill up on the delicious crab legs, but just as impressive as the food is the amazing service.